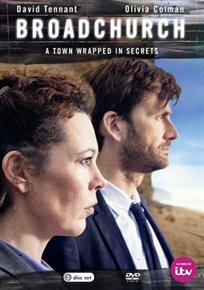 The complete ITV crime drama starring David Tennant and Olivia Colman. When an eleven-year-old boy is discovered murdered at the foot of the cliffs that dominate the Dorset down of Broadchurch, two police officers with contrasting approaches are assigned to the case. Broadchurch resident DS Ellie Miller (Colman) is a friend of the boy's mother, Beth (Jodie Whittaker), and treads carefully to avoid offending the community. In contrast, outsider DI Alex Hardy (Tennant) is all business. Will either of them be able to get to the bottom of the mystery?